The public OpenSim grids reached a new high of active users, 35,692, an increase of more than 2,000 since this time last month. The 2016 OpenSim Community Conference was responsible for about a quarter of the increase, but many other grids also saw gains. The total number of registered users went up by 12,190, the biggest single-month increase since early 2013, to 511,559, crossing the half-million mark again. The total number of registered users had hit that high point earlier this year, but then fell dramatically when Avination, one of OpenSim’s oldest grids, shut down for maintenance in mid-summer. Avination is still down, and there are still no estimates of when the grid will be coming back. The land area of OpenSim dropped by around 1,300 regions, but that was due to ZetaWorlds, which dropped from 1,527 standard region equivalents to just 171 — the grid is currently in beta and is undergoing some dramatic changes while they’re testing load balancing and other things to get ready for an official public launch. AviWorlds has also not recovered yet from its latest collapse, despite some indications of progress earlier this month. Kea Nation, one of the grids caught up in that disaster, is also down temporarily while it is migrating to new hosting. Land area of OpenSim’s public grids, in standard region equivalents. 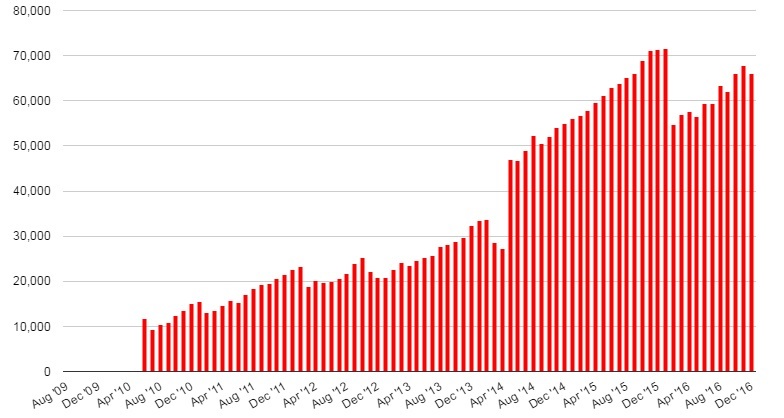 As mentioned above, the total number of active users on the public OpenSim grids reached a record high of 35,692. The big gainer this month, was, of course, the OpenSim Community Conference grid, which gained over 500 active users due to last weekend’s conference. OSgrid gained 201 users. On the other end of the spectrum, Great Canadian Grid, while still retaining a very solid 1,050 actives, lost 162 since this time last month. And InWorldz, while still retaining the top slot, lost 135. 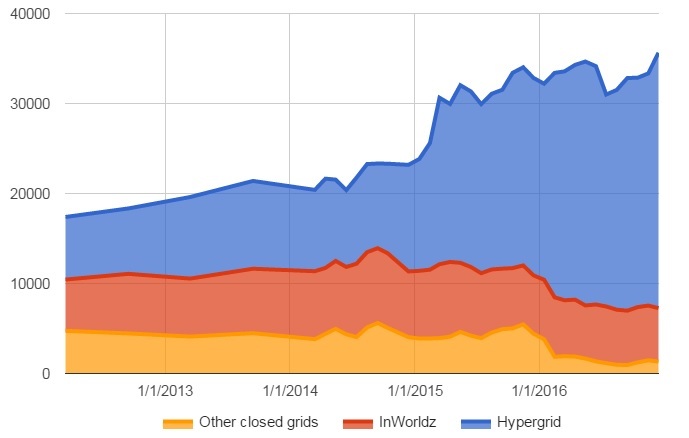 Hypergrid-enabled grids, where users can teleport freely to other grids, are now home to 78 percent of OpenSim’s active users, a near-record high proportion. The easy-to-use Dreamworld OpenSim installer has been downloaded 685 times since it was released late this summer — that’s more than 300 new downloads this past month, according to developer Fred Beckhusen. The installer creates a free, local mini-grid on the user’s computer, with the choice of either keeping the grid private, or making it accessible via the hypergrid. About a quarter of these mini-grids are hypergrid-enabled, Beckhusen told Hypergrid Business. 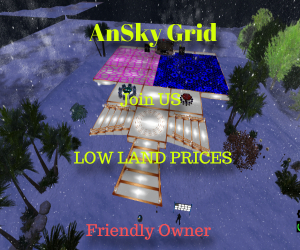 The Lithuanian My Virtual Community grid has cut land prices dramatically. Previously, regions were 30 Euros (US $31.35) for 15,000 prims. Now, residents can rent 25,000-prim regions for just 5 Euros per month, or US $5.23, with discounts available for people who pay ahead for several months. 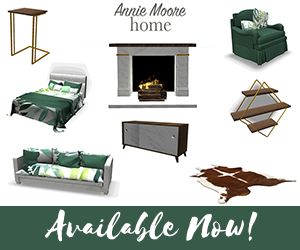 See full pricing details here. The grid is also becoming more involved with the community. “My partner Natasha Thiebaud now is in OpenSim core developers list,” grid founder Arturas Baltrukaitis told Hypergrid Business. Creanovale is a small grid, with the equivalent of 41 standard regions, and just eight registered users. But it’s become a magnet lately for hypergrid visitors, with people coming from 35 different grids. Active users grew from 51 a month ago to 105 this month. Like many smaller grids, Kalasiddhi uses the Diva Distro Wifi screen for its stats report. However, this screen only shows the number of named regions, not the total land area of the grid. So Kalasiddhi, for example, shows as having 26 regions. But many of them are variable-sized regions, larger than standard. If all land was converted to regular regions, or to mega-regions, this display screen would then show a total of 73 regions. Here at Hypergrid Business, I think that land is land. It doesn’t matter what kind of region it is, or where the border crossings are, as far as I’m concerned, if you can walk on it and build on it, it’s as good as any other land out there, and when I collect land stats, I ask for the total in square meters, square kilometers, or in standard region equivalents. For smaller grids, this means opening up their OpenSimulator console and issuing the “show grid size” server command, or hirding developers to add the functionality to their websites. Kalasiddhi Grid owner Drang Po is hoping that someone in the OpenSim community can come up with a way to publish the land area statistic to a web page or to the Wifi page. “I’m betting a lot of us little folk that can’t afford to hire programmers would appreciate it,” he said. PMGrid has added server capacity and increased bandwidth, and can now offer more free regions for OpenSim users and better performance. The grid has also added a service from ThinkBroadBand that checks the grid’s performance. The service is free, he said, and the load is minimal. The service also records historical data, and it can be used to figured out whether latency problems are due to the user’s connection, or is on the grid’s end. We added three new grids to our database this month: The Public World, One More Grid and JadeyLand. The following 23 grids were marked as suspended this month: 2Worlds2Go, 3DHappiness, Admeja, AvatarHaven, Avi Brasil, Avination, AviWorlds, CINECA GRID, Cuon, Dreamworldz, GEA, Homeland, HyperWild, Ingen-Lab, Ipsofacto, JamGrid, Kea Nation, Mystery, Pseudospace, Revo Grid, SimGrid, Traduverse, and Unreal. The list below is a small subset of existing OpenSim grids. We are now tracking a total of 1,191 different publicly-accessible grids, 277 of which were active this month, and 205 of which published their statistics.